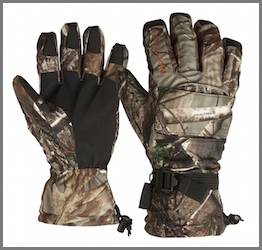 Wear the fleece inner glove during bow season and other cool weather hunts. Add the breathable, wind and water resistant outer glove as the weather begins growing more adverse. Camp gloves feature a tuff-grip palm and fingers for excellent grip and an adjustable drawcord and pull strap at the wrist cuff allowing for a snug fit around your wrist. Pre-curved finger design for added comfort and ease of use. Outer glove features a durable and quiet polyester tricot shell with a polyester lining containing ArcticShield heat retention technology.